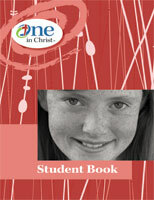 Grade six materials consist of 100 lessons that present a sequential Bible survey of the Old and New Testaments. Each lesson is designed to be taught in 35–45 minutes. One in Christ Grade 6 teaching materials are arranged in nine units, each with its own theme, worship suggestions, bulletin board, and mission story. Each lesson contains a lesson plan with background information, a classroom devotion, the main theme, lesson objectives, Law & Gospel points, and a materials listing. Unit 6: Who Is Jesus? Four high-interest biographies teach students about the lives of four heroes of faith: Martin Luther, Heinrich Melchior Muhlenberg, Dorothea Craemer, and Dr. Bessie Rehwinkel. 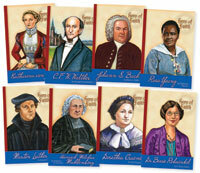 These books will teach students how God used these men and women to further His kingdom.